I was honored to speak at Robert Solomon Wistrich’s, z‘‘l, last big conference in May 2014 in Jerusalem, Mount Scopus, at SICSA. Robert also had invited me to his first big conference as head of the Vidal Sassoon International Center for the Study of Antisemitism (SICSA) in December 2002. What is in this lecture? 5) Was Hitler a “Man of the Left”? 6) Left-wingers in Germany and Austria: pro-Israel and anti-Jewish? Columbia University Iranian studies scholar Hamid Dabashi has become the darling of German academia. It’s no coincidence that he exemplifies academic hatred for Israel and the trivialization of Germans crimes and the Holocaust. Germany is a hotbed of academic antisemitism, particularly in the fields of Islamic and Middle Eastern studies. Germans are particularly pleased with non-European scholars, such as Dabashi, who will defame Israel and downplay the crimes of the Holocaust. French philosopher Vladimir Jankélévitch analyzed this new antisemitism as early as 1971 in his piece, “Forgiving?” (“Pardonner?”), in which he noted Germans’ need to accuse Jews of being “like Nazis.” Turning their former victims, the Jews, into perpetrators diminishes the Germans’ unprecedented crimes. Scholarship labels this the “inversion of truth.” It can also be framed as “secondary anti-Semitism,” a form of post-Holocaust antisemitism. Denying Auschwitz is for beginners. Dabashi calls his new book, Can Non-Europeans Think? (April 2015), part three of his “Intifada trilogy.” In it, Dabashi promotes the trope, popularized by anti-Israel activist Ilan Pappé, that Israel is committing an “incremental genocide” of the Palestinians. Palestinian sources themselves admit that the populations of Gaza and the West Bank have grown in recent decades, rendering this definition of “genocide” particularly perfidious. As I demonstrated in my 2013 book, Dabashi wants to destroy the Jewish state of Israel, which he calls a “racist Apartheid state.” He supported German former Waffen SS member and Nobel Prize Laureate Günter Grass after he’d written a nasty anti-Israel poem portraying Iran as a victim of Israeli aggression. According to international scholarship and the US State Department, the comparison or equation of Israel to Nazi Germany is antisemitic in effect if not intent. In 2014, as Martin Kramer noted, Dabashi equated Auschwitz with Gaza with his article, “Gaza: Poetry after Auschwitz.” In a leading German daily, the Frankfurter Allgemeine Zeitung (FAZ), DirkBraunstein of the Frankfurt Institute for Social Research, an expert on the philosopher Theodor W. Adorno — whom Dabashi employed for his flawed comparison — proffered the same criticism. Dabashi is eager to use Jewish philosophers such as Edmund Husserl, eminent Zionist Emmanuel Lévinas, and Adorno — who was very pro-Israel, as recentscholarship, including my own, has shown — for his anti-Semitic purposes. He is influenced by anti-Zionist, post-colonialist authors Edward Said, Gianni Vattimo, and Walter Mignolo. Mignolo, an Argentinian-born supporter of the anti-Jewish state resolution, “One State Solution,” wrote the foreword to Dabashi’s Can Non-Europeans Think? [T]he Jewish Holocaust was not an aberration in European history. Rather, Europeans actually perpetrated similar crimes against humanity on the colonised world at large. This is an extreme distortion of history, a lie, and a denial of the unprecedented evil of the Holocaust, in which Germans (and their helpers) killed six million Jews. Never before was there the intention, plan, and the infrastructure to murder an entire people. Auschwitz was a complete breakdown of civilization and not in any way comparable to crimes committed during colonialism, imperialism, or any other atrocity in history. It was no less than the industrial slaughter of a people. Millions of other Jews were deported to the woods of Eastern Europe and eradicated. It was in every way unparalleled. The government-sponsored German Institute for Foreign Affairs and other leading universities would never host a known neo-Nazi who claims that Israel is an “apartheid state,” that Auschwitz was a mere “crime” on par with the 2014 Gaza war, and that the Iranian threat does not exist. 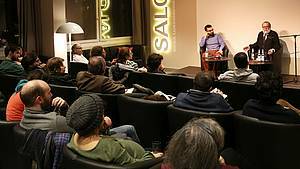 However, a non-European like the Iranian-born Dabashi is not only welcomed, but embraced by German audiences for two reasons: hatred of Israel and the distortion of German crimes and the Holocaust. Can non-Europeans think? Of course. Can non-Europeans be antisemites and hateful agitators, obsessed with the trivialization of the Shoah as well as with the destruction of the Jewish State? Obviously, yes. Dabashi proves the point. The author, Dr. Clemens Heni, is a political scientist, the Director of the Berlin International Center for the Study of Antisemitism (BICSA), a former Post-Doc at YALE. He is author of five books, including “Schadenfreude. Islamic Studies and Antisemitism in Germany after 9/11” (2011, in German, 410 pages) and “Antisemitism: A Specific Phenomenon: Holocaust Trivialization – Islamism – Post-colonial and Cosmopolitan anti-Zionism” (2013, 648 pages, in English). He wrote this essay forCampus Watch, a project of theMiddle East Forum. Facebook ist ein riesiges soziales Medium, das Menschen weltweit die Möglichkeit gibt, sich unkompliziert über alle möglichen sinnlosen wie sinnvollen Aspekte des Lebens auszutauschen. Kritik an Facebook kann antisemitisch sein, und ist also keine Kritik mehr, sondern Ressentiment, z.B. wenn die Süddeutsche Zeitung 2014 Mark Zuckerberg als Krake karikiert, die eine Art Hakennase hat, als Tentakeln verfremdete Schläfenlocken besitzt und mit ihren Fangarmen böswillig die Menschheit auffressen möchte. Verschwörungsfantasien gehören zum Kernbestandteil des modernen Antisemitismus und sind von äußerster Gefährlichkeit. Die 1905 erstmals publizierten „Protokolle der Weisen von Zion“ sind das Vorbild bzw. die Matrize aller späteren antisemitisch motivierten Verschwörungsfantasien. Und das Krakenmotiv ist genuin nationalsozialistisch. Voilà, die im Geheimen wühlenden Weltverschwörer! Die wittert auch die Frankfurter Allgemeine Zeitung. Deren Medienredakteur Michael Hanfeld sagt, Zuckerberg komme „dahergeritten wie der heilige Martin“, tatsächlich aber sitze er „auf dem größten trojanischen Pferd seit den Zeiten von Odysseus“. „Mit sentimentalem Ton“, jedoch „verlogen“, mit der „Camouflage“ des Unschuldigen betreibe er sein „globales Geschäft“. Per Überschrift rückt die FAZ den „knallharten“ Zuckerberg in die Nähe von Stasi-Chef Mielke: „Dabei liebt er uns doch alle“. Moderne Antisemiten meiden das Wort Jude, besinnen sich jedoch bei passender Gelegenheit auf das klassische Repertoire – gespeist aus Neid, Unvermögen und frustrierter Gehässigkeit. Er meint hier, wenn schon, dann den sog. „neuen“ Antisemitismus, den es nach dem Holocaust gibt und der vor allem in den letzten 15 Jahren zu großen Debatten führte und führt. Der Ausdruck „moderne Antisemiten“ erinnert vielmehr an den Beginn des „modernen“ Antisemitismus Ende des 19. Jahrhunderts, als der biologische Rassenantisemitismus der völkischen Bewegung den religiös und christlich motivierten Judenhass ablöste. Zentral für den modernen und rassebiologischen Antisemitismus ist der Verschwörungswahnsinn. „Der Jude“ wird als die geheime Macht hinter allem Übel, hinter der unterminierenden Funktion von U-Bahnen, Finanzgeschäften und allen Formen des Kapitalismus wie des Kommunismus oder sexueller Ausschweifung und der Aushöhlung des christlichen Abendlandes wie auch, später, des muslimischen Morgenlandes imaginiert. Die ganze Welt denkt, Mark Zuckerberg habe seiner Tochter einen Brief geschrieben. Hat er aber nicht. Er nimmt die Geburt der kleinen Max vielmehr zum Anlass, seinen persönlichen Weltmachtanspruch zu formulieren. Er hat eine Regierungserklärung verfasst, der wir entnehmen können, wie die Welt aussieht, wenn Facebook das Sagen hat. Sie ist bunt, vielfältig und friedvoll. Es gibt nur noch saubere Energie und keine Krankheiten mehr. Für kreatives Unternehmertum existieren keine Grenzen. Es gibt „starke“ und „gesunde“ Gemeinschaften. Und alle Menschen haben gleiche Chancen. Wie bekommen sie die? Durch die richtige Erziehung, die richtige Gesundheitsvorsorge und – einen freien Zugang zum Internet. Wer diesen schafft und garantiert, ist klar: Papas Firma. So hört sich also Hitler 2.0 an, laut Götz Aly. Dabei analysiert Hanfeld lediglich die Mechanismen des Neoliberalismus, böse Stimmen würden sagen: des Kapitalismus in seiner heutigen Form. Dabei spielen Kontrolle, Wissen, Sammeln von Daten nicht nur für die Werbeindustrie, das Internalisieren der Imperative des Marktes, dass alles – alles – eine Ware ist, die zentrale Rolle. Natürlich ist es übertrieben, alleine daraus einen „Weltmachtanspruch“ zu sehen, aber übertreiben in Richtung Wahrheit ist eine Methode, die man seit Günther Anders kennen sollte. Es ist das fröhliche Mitmachen, die Selbst-Verwertung, das lachende Posten auf Facebook ist beherrschend. Dissidenz oder Abstinenz werden a priori eskamotiert, wie es Adorno vielleicht formulieren würde. Wer sind die IT-Unternehmen, die den Zugang zum Netz gewährleisten werden, im Senegal wie in Berlin oder auf Haiti? Wer kontrolliert da was gespeichert wird und wozu? Was geht es Facebook an, was Leute sich in privaten Nachrichten sagen etc. pp.? Ist die total saubere, gesunde und keimfreie Welt nicht ein aseptischer Albtraum? Das spricht nicht gegen Klimaschutz aber gegen totale Kontrolle und das survival of the happiest. In der vorwegnehmenden Identifikation der zu Ende gedachten mathematisierten Welt mit der Wahrheit meint Aufklärung vor der Rückkehr des Mythischen sicher zu sein. Sie setzt Denken und Mathematik in eins. Günther Anders hätte heute einen Band über die Antiquiertheit des Menschen im Facebook-Zeitalter schreiben können. Und man könnte – wie „wir“ es schon in den 1990er Jahren an der Uni Bremen als Studierende taten – den „binären Faschismus“ des digitalen Zeitalters untersuchen und kritisieren. O + 1. Dazu kann man gar Facebook, Smartphones, Laptops, Tablets und PCs etc. benutzen. Das nennt man Dialektik. Mehr noch: dass gerade Götz Aly anderen Antisemitismus vorwirft ist lustig, wenn man sich anschaut, wie obsessiv er bemüht war in seinen Schriften, das Spezifische des Antisemitismus wie die Sinnlosigkeit der Vernichtung der europäischen Juden zu negieren und ein cui bono zu suchen, sei es Nazi-Bevölkerungspolitik oder der „Neid“ der deutschen Volksgemeinschaft. Als ob deutsche SS-Männer und Polizeibataillone Millionen Juden aus allen Teilen Europas abschlachteten und industriell vernichteten, weil sie neidisch gewesen wären. Doch Götz Aly kommt aus der „sozialrevolutionären Schule“ des Altmarxisten Karl-Heinz Roth und nach dieser kommt dem Antisemitismus gerade keine spezifische, wenn überhaupt eine Rolle zu. Als Aly 2010 zufällig – aufgrund seiner Leistung kann das kaum passiert sein – Fellow in Yad Vashem war, aufgrund der Attacke des Terrorschiffes Mavi Marmara, das von der israelischen Armee aufgebracht worden war, von einem „israelischen Massaker“ gleichsam faselte, noch bevor klar war, was passiert war im Mittelmeer, war sein Ressentiment gegen Israel offenkundig. Eine Woche später musste er zurückrudern, aber seine spontane antiisraelische Agitation spricht Bände. Einer wie Götz Aly, der dann auch noch die Kritik an der hetzerischen Springer-Presse 1968 mit der Bücherverbrennung 1933 analogisiert und somit den Nationalsozialismus ein weiteres Mal trivialisiert oder rationalisiert, sollte zurückhaltend sein, Journalisten wie Michael Hanfeld oder der FAZ einen Antisemitismus, wie er auch in Hitlers „Mein Kampf“ zu finden sei, zu unterstellen. Eine differenzierte Kritik am Kapitalismus 3.0, wie er sich bei Facebook zeigt und zeigen wird, muss möglich sein und ist möglich, ohne in einen reaktionären Antikapitalismus zu verfallen, der geheime Mächte oder Juden hinter allem Bösen vermutet. Hanfeld vermutet doch viel eher, wenn ich mich nicht täusche und wenn man seinen Text liest, sehr spezifische Strukturen, Facebook oder Internetfirmen, deren mathematisches und unternehmerisches, kapitalistisches Apriori Horkheimer und Adorno oder Günther Anders heute womöglich ganz ähnlich analysieren würden wie dieser FAZ-Text. Eine Dialektik der Aufklärung 3.0. Der FAZ-Herausgeber Jürgen Kaube nennt es in einem Offenen Brief an Götz Aly „Ideologiekritik“. Die leisten zu können, davon kann ein Götz Aly nicht mal träumen.